Jimmy Butler drives against the Los Angeles Clippers’ Jerome Robinson earlier this season. 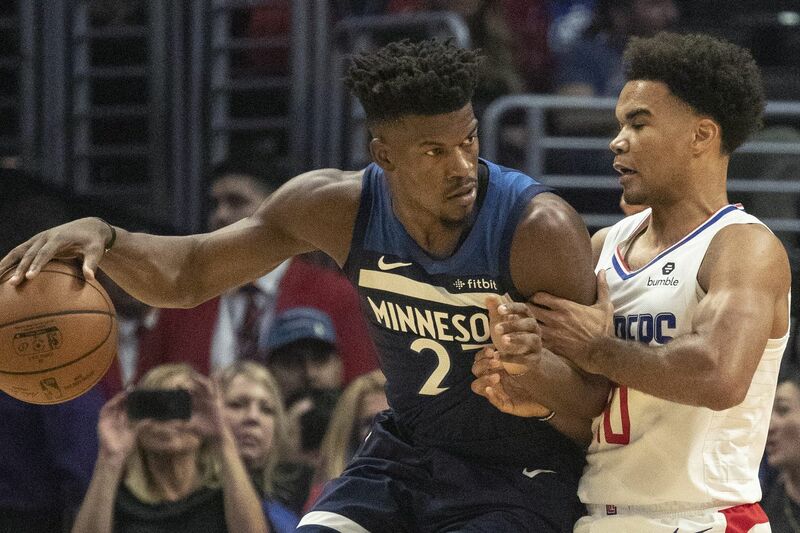 If you were to design the ideal player to star alongside Joel Embiid and Ben Simmons, there are a lot of ways in which he would differ from Jimmy Butler. From his volume-dependent point production to his mediocre three-point shot to his habit of clashing with younger players, the 29-year-old star is hardly the perfect fit for a Sixers team that has less than a year to put the finishing touches on the core it will rely upon for the next half decade. But the one overriding takeaway from the organization's decision to acquire the disgruntled veteran from the Timberwolves, while parting ways with two beloved starters is this: Not only does Butler makes the Sixers better right now, in the midst of a sputtering 8-5 start, but he has the potential to make them a whole lot better come April, by which time the Sixers will need to have experienced a radical transformation to compete in an Eastern Conference playoff field that includes powerhouses in Boston and Toronto and an upstart Bucks squad in Milwaukee. This is as much about the next move as it is about the current one. At some point, the Sixers were going to arrive at a point at which they needed to make decisions on Covington and Saric. As inseparable as Saric may seem to the identity of this team, the odds always seemed to be against his signing an extension here, given the team's stated goal of adding at least one superstar to the mix. There was always going to be an odd man out, and Saric always seemed as if he would be it. Simply put, he was going to be worth more to a team not already stretched financially and loaded with stars. Covington's contract, at about $12 million per year, is a good bet to remain reasonable throughout its duration (witness the one-year, $15 million deal signed by Trevor Ariza this offseason). But it was also an obvious contract to move to facilitate the addition of external talent. By trading Covington and Saric, the Sixers have put themselves in a position to add a second max contract next summer, even if they re-sign Butler. The early reports suggest that the Sixers and Butler are optimistic about reaching a deal next summer. Presumably, this will be for the maximum amount that Butler is eligible to sign under the terms of the current collective bargaining agreement. That's about five years and $190 million, although the raw numbers are not important right now. The important thing is that the Sixers won't have to do much heavy lifting to get their payroll to a place at which they can afford to add a second max contract free agent next summer. By my calculations, the Sixers would have about $24 million in room under the cap, with Simmons, Embiid, Butler, Markelle Fultz, Landry Shamet, Zhaire Smith, and Jonah Bolden under contract. They'd have the ability to free up another $11-plus million by trading away Fultz and one of the younger players. That would give them the ability to sign pretty much any elite free agent who is willing to come to Philly. Essentially, what the Sixers did was trade Covington for an upgrade in Butler, then say goodbye to Saric two years early, while also getting rid of the Jerryd Bayless contract. Jimmy Butler contests Kawhi Leonard’s shot earlier this season. The Sixers have a chance to put one of the league's elite defensive squads on the floor. That's significant, especially when you consider that their struggles defending the perimeter have only become more amplified this season. In that loss to the Nets last Sunday, it was jarring to watch Brooklyn's ballhandlers getting to the rim at will against a Sixers team that was at a loss to defend Terry Rozier in last year's conference semifinals against Boston. In addition to getting a player able to create shots for himself in Butler, they get one of the league's premier on-the-ball defenders, a guy who certainly will not be benched for T.J. McConnell in a make-or-break postseason game, as Covington was last May. Don't take that the wrong way. Covington filled an important role, and was a very good team defender. But Butler, a four-time second-team All-Defensive team member, is a clear upgrade. It will be interesting to see what Brett Brown does with his lineups. He has the option of simply plugging in Mike Muscala for Saric at the four, but he could also go with a smaller lineup that puts Wilson Chandler on the court, with either Chandler or Ben Simmons guarding the four. The Sixers will need to replace Dario Saric’s skillset at the power forward spot by finding a four who can shoot the ball from beyond. The Sixers will have to add some three-point shooting at some point between now and the playoffs. Butler brings a lot of offensive abilities, particularly with his ability to create his shot and finish at the rim (relative to Covington). If his three-point percentage were 10 to 20 points higher, he really would be an ideal fit. He has gotten more efficient over the past couple of years, with a .502 effective field goal percentage and a respectable .361 mark from downtown. That's right around where Covington has been throughout his career. It's Saric where they lose a crucial skill set without getting any replacement. He really struggled from behind the arc to start the season, but, against the Pacers on Wednesday night, we saw how much different this team looks when it has a four-man on the court who is knocking down shots from long range (Saric was 6-for-13 in a six-point win over Indiana after starting the season shooting .232 from beyond). We also saw that last season, when Ersan Ilyasova arrived and enabled Brown to have a four-man capable of stretching defenses out even when Saric was on the bench. That hole will be one of the more interesting things to watch with this team in the short- to medium-term future. All in all, the price-point of this trade made it a near-no-brainer. The Sixers clearly weren't going to be able to compete with the Celtics and Raptors without changing the fundamental complexion of this team. Saric and Covington were both valuable but flawed players, especially with regards to Saric's defense. This move enables them to try to develop a new identity for this season while maintaining their ability to chart whatever course they choose next summer. It sounds as if that course will include Butler. The important thing is that it could also include another star.